The word cherub (cherubim is the Hebrew masculine plural) is a word borrowed from the Assyrian kirubu, from karâbu, "to be near", hence it means near ones, familiars, personal servants, bodyguards, courtiers. It was commonly used of those heavenly spirits, who closely surrounded the Majesty of God and paid Him intimate service. Hence it came to mean as much as "Angelic Spirit". (The change from K of Karâbu, to K of Kirub is nothing unusual in Assyrian. The word has been brought into connection with the Egyptian Xefer by metathesis from Xeref=K-r-bh.) 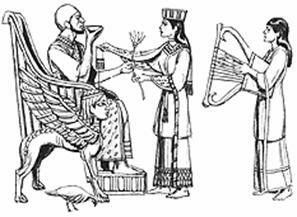 A similar metathesis and play upon sound undoubtedly exists between Kerub and Rakab, "to ride", and Merkeba, "chariot". The late Jewish explanation by analogy between Kerub and Rekûb, "a youth", seems worthless. The word ought to be pronounced in English qerub and querubim, and not with a soft ch. That is the summary of the stand of the early Christians. Now let us look into what the Bible reveals with regard to the Cherubims and how the bible interpreters try to explain them. Gen 3:24 So he drove out the man; and he placed at the east of the garden of Eden the Cherubim, and the flame of a sword which turned every way, to keep the way of the tree of life. There is no intimation given of their shape or form. In these they are images of Cherubim. No claim is made as regard to whether they are living beings or not. This is claimed only in the visions of Ezekiel and John. Exo 25:17 And thou shalt make a mercy-seat of pure gold: two cubits and a half shall be the length thereof, and a cubit and a half the breadth thereof. Exo 25:18 And thou shalt make two cherubim of gold; of beaten work shalt thou make them, at the two ends of the mercy-seat. Exo 25:19 And make one cherub at the one end, and one cherub at the other end: of one piece with the mercy-seat shall ye make the cherubim on the two ends thereof. Exo 25:20 And the cherubim shall spread out their wings on high, covering the mercy-seat with their wings, with their faces one to another; toward the mercy-seat shall the faces of the cherubim be. Exo 25:21 And thou shalt put the mercy-seat above upon the ark; and in the ark thou shalt put the testimony that I shall give thee. Exo 25:22 And there I will meet with thee, and I will commune with thee from above the mercy-seat, from between the two cherubim which are upon the ark of the testimony, of all things which I will give thee in commandment unto the children of Israel. Num 7:89 And when Moses went into the tent of meeting to speak with him, then he heard the Voice speaking unto him from above the mercy-seat that was upon the ark of the testimony, from between the two cherubim: and he spake unto him. They were placed one at each end of the mercy-seat, with wings stretched upward, and their faces "toward each other and toward the mercy-seat." They were anointed with holy oil, like the ark itself and the other sacred furniture. These are the representations of the mercy seat which has been in vogue till recently. 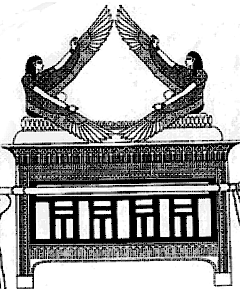 However in recent archeological discoveries the cherubims are not seated on the ark but are standing on either side. There is no statement in the Bible as to the Cherubims sitting on the ark, They are always by the two sides covering the ark. The modern rendition is as follows which fits more to the Revelation scene. Exo 26:1 Moreover thou shalt make the tabernacle with ten curtains; of fine twined linen, and blue, and purple, and scarlet, with cherubim the work of the skilful workman shalt thou make them. Here cherubim figures are woven into the curtains that separates the tabernacle from the rest of the world. 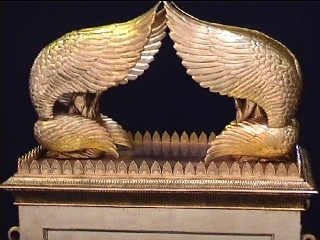 This is symbolic of the function of the cherubim described in Gen. 3:24 They guard the entry into the holy places within the tabernacle. Only the elect will be able to enter the holies. Exo 26:31 And thou shalt make a veil of blue, and purple, and scarlet, and fine twined linen: with cherubim the work of the skilful workman shall it be made. Exo 26:32 And thou shalt hang it upon four pillars of acacia overlaid with gold; their hooks shall be of gold, upon four sockets of silver. In Solomon’s temple also we see Cherubim everywhere including the temple walls. 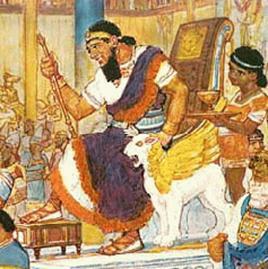 Two cherubim were placed on the mercy-seat of the ark; two of colossal size overshadowed it in Solomon's temple. Ki 6:29 And he carved all the walls of the house round about with carved figures of cherubim and palm-trees and open flowers, within and without. The idea that the throne of God is Cherubim is certainly ridiculous, because God do not have a physical form. Yet God did talk to Moses from amidst the Cherubim. Was this a picturesque way of telling that Yhvh is King or was there a real form. Unless we want to think that God was fooling man we should think that there indeed was a form of God. Lord having a form is not new even in the Old Testament as indicated in Gen 18 and Ex 24:10. The concept of The Angel of Yhvh as the visible appearance of God in an experiential way is evidently clear through out the Old Testament. Without such an assumption many of the biblical terms and stories will become absurd. Here then is the real Yhvh as can be seen and heard by Moses and Abraham and elders of Israel. So in the world we are in – in the material dimension of Man, God entered and reacted with him long before Jesus himself incarnated. One of these expression was the appearance from between the mercy seat. Here Cherubim throne expresses his Kingship. 1Sa 4:4 So the people sent to Shiloh; and they brought from thence the ark of the covenant of Jehovah of hosts, who sitteth above the cherubim: and the two sons of Eli, Hophni and Phinehas, were there with the ark of the covenant of God. Isa 37:16 O Jehovah of hosts, the God of Israel, that sittest above the cherubim, thou art the God, even thou alone, of all the kingdoms of the earth; thou hast made heaven and earth. Psa 80:1 Give ear, O Shepherd of Israel, Thou that leadest Joseph like a flock; Thou that sittest above the cherubim, shine forth. Psa 99:1 Jehovah reigneth; let the peoples tremble: He sitteth above the cherubim; let the earth be moved. 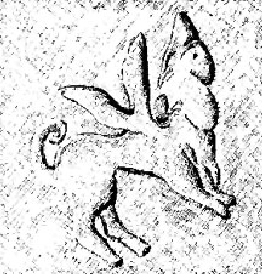 These can be seen from the art of the period. 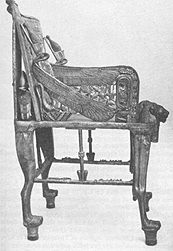 Canaanite nobleman or prince sitting in sphinx-chair. 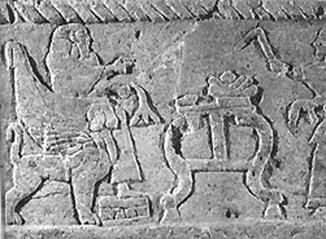 This scene is drawn from an ivory carving found at the Canaanite stronghold of Megiddo. It appears in Readers' Digest Great People of the Bible and How They Lives (Readers' Digest Association, 1974), p. 100. While the Tabernacle and the temple figures were representations, visions of Ezekiel and John presents them as real living beings. So it appears that the replication of Tabernacle images were simply modeled out of the reality that was in heaven. They were visual communications of heavenly reality in concrete form to the Israel and to the Church. 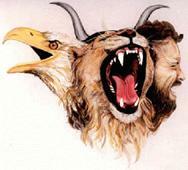 Cherubim as the Vehicle of God. Then we have the concept of Cherubim as the vehicle of God. 2Sa 22:11 And he rode upon a cherub, and did fly; Yea, he was seen upon the wings of the wind. 2Sa 22:12 And he made darkness pavilions round about him, Gathering of waters, thick clouds of the skies. In Indian terms, Vishnu is the expressed form of Brahman. Vishnu is identified as YhVh in the Bhavishya Purana when it talks about Adam, Enoch and Noah. In Hindu mythology Garuda the Eagle is the Vehicle – Vahana - of Vishnu. Is this a coincidence? I have elsewhere proposed that these concepts came into Indian thought only after the first century AD after the widespread Apostolic mission of St. Thomas. If this is true these pictures entered into Indian thought through such pictures of Cherubim as interpreted in Indian terms. In Ezekiel's vision (Eze. 10:1-20) they appear as living creatures supporting the throne of God. Eze 1:10 As for the likeness of their faces, they had the face of a man; and they four had the face of a lion on the right side; and they four had the face of an ox on the left side; they four had also the face of an eagle. Many of the members of my Bible Study Group were shocked by this picture which are very similar to the pagan idols and Hindu gods. The fact is that these are heavenly beings if we accept the visions of Ezekiel and John as true scenes of the opened heaven. This shock has been expressed in various ways to try to explain away these pictures. I must mention that these are the likenesses. Or they appeared to the visionaries like those faces. Since the visionaries cannot explain what they say except in terms of what they know and understand they have made the best likeness of the heavenly beings. In the idol worship the heavenly beings are worshipped and they take the form of creatures below. Eze 1:11 And their faces and their wings were separate above; two wings of every one were joined one to another, and two covered their bodies. Eze 1:12 And they went every one straight forward: whither the spirit was to go, they went; they turned not when they went. Eze 1:13 As for the likeness of the living creatures, their appearance was like burning coals of fire, like the appearance of torches: the fire went up and down among the living creatures; and the fire was bright, and out of the fire went forth lightning. Eze 1:15 Now as I beheld the living creatures, behold, one wheel upon the earth beside the living creatures, for each of the four faces thereof. Eze 1:16 The appearance of the wheels and their work was like unto a beryl: and they four had one likeness; and their appearance and their work was as it were a wheel within a wheel. Eze 1:17 When they went, they went in their four directions: they turned not when they went. Eze 1:18 As for their rims, they were high and dreadful; and they four had their rims full of eyes round about. Eze 1:19 And when the living creatures went, the wheels went beside them; and when the living creatures were lifted up from the earth, the wheels were lifted up. Eze 1:20 Whithersoever the spirit was to go, they went; thither was the spirit to go: and the wheels were lifted up beside them; for the spirit of the living creature was in the wheels. Eze 1:21 When those went, these went; and when those stood, these stood; and when those were lifted up from the earth, the wheels were lifted up beside them: for the spirit of the living creature was in the wheels. Eze 1:22 And over the head of the living creature there was the likeness of a firmament, like the terrible crystal to look upon, stretched forth over their heads above. Eze 1:23 And under the firmament were their wings straight, the one toward the other: every one had two which covered on this side, and every one had two which covered on that side, their bodies. Eze 1:24 And when they went, I heard the noise of their wings like the noise of great waters, like the voice of the Almighty, a noise of tumult like the noise of a host: when they stood, they let down their wings. Eze 1:25 And there was a voice above the firmament that was over their heads: when they stood, they let down their wings. Eze 1:26 And above the firmament that was over their heads was the likeness of a throne, as the appearance of a sapphire stone; and upon the likeness of the throne was a likeness as the appearance of a man upon it above. Eze 1:27 And I saw as it were glowing metal, as the appearance of fire within it round about, from the appearance of his loins and upward; and from the appearance of his loins and downward I saw as it were the appearance of fire, and there was brightness round about him. We should remember that Ezekiel is describing something of which he has no idea. He sees the four living beings with several wings and several heads He also sees wheels and wheels within the wheels. He sees all the four cherubs as one unity, united in motion and somehow related to the wheels. They rose up and flew and landed. They used the wings to fly and let drop it when landed. Wheels turned and guided the flight. It is most like an man of the first centuary being asked to describe what he sees when a boeing 747 lands and take off. There is a vehicle involved. Inside Ezekiel could see the living beings. Did he believe that the wheels had life. He is not trying to give an interpretation, but was simply describing what he saw. In Revelation we do not see the wheels. We only see the Throne of God and the four living being around it. The vision of the wheels within wheels suggests that the living beings were in some mechanical vehicle. They are thus seen united with the vehicle itself. The human figure actually walks into it. Eze 10:1 Then I looked, and behold, in the firmament that was over the head of the cherubim there appeared above them as it were a sapphire stone, as the appearance of the likeness of a throne. Eze 10:2 And he spake unto the man clothed in linen, and said, Go in between the whirling wheels, even under the cherub, and fill both thy hands with coals of fire from between the cherubim, and scatter them over the city. And he went in in my sight. Eze 10:3 Now the cherubim stood on the right side of the house, when the man went in; and the cloud filled the inner court. Eze 10:4 And the glory of Jehovah mounted up from the cherub, and stood over the threshold of the house; and the house was filled with the cloud, and the court was full of the brightness of Jehovah's glory. Eze 10:5 And the sound of the wings of the cherubim was heard even to the outer court, as the voice of God Almighty when he speaketh. Eze 10:6 And it came to pass, when he commanded the man clothed in linen, saying, Take fire from between the whirling wheels, from between the cherubim, that he went in, and stood beside a wheel. Eze 10:7 And the cherub stretched forth his hand from between the cherubim unto the fire that was between the cherubim, and took thereof, and put it into the hands of him that was clothed in linen, who took it and went out. Eze 10:8 And there appeared in the cherubim the form of a man's hand under their wings. Eze 10:9 And I looked, and behold, four wheels beside the cherubim, one wheel beside one cherub, and another wheel beside another cherub; and the appearance of the wheels was like unto a beryl stone. 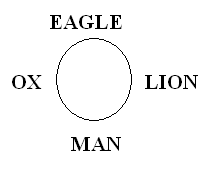 Eze 10:10 And as for their appearance, they four had one likeness, as if a wheel have been within a wheel. Eze 10:11 When they went, they went in their four directions: they turned not as they went, but to the place whither the head looked they followed it; they turned not as they went. Eze 10:12 And their whole body, and their backs, and their hands, and their wings, and the wheels, were full of eyes round about, even the wheels that they four had. Eze 10:15 And the cherubim mounted up: this is the living creature that I saw by the river Chebar. Eze 10:16 And when the cherubim went, the wheels went beside them; and when the cherubim lifted up their wings to mount up from the earth, the wheels also turned not from beside them. Eze 10:17 When they stood, these stood; and when they mounted up, these mounted up with them: for the spirit of the living creature was in them. Eze 10:18 And the glory of Jehovah went forth from over the threshold of the house, and stood over the cherubim. Eze 10:19 And the cherubim lifted up their wings, and mounted up from the earth in my sight when they went forth, and the wheels beside them: and they stood at the door of the east gate of Jehovah's house; and the glory of the God of Israel was over them above. Eze 10:20 This is the living creature that I saw under the God of Israel by the river Chebar; and I knew that they were cherubim. Eze 10:21 Every one had four faces, and every one four wings; and the likeness of the hands of a man was under their wings. There are four Cherubim in this vision. The number four appear again in John’s vision. This is also number of "living creatures" is mentioned in Rev 4:6. Here the position of the cherubim are slightly changed and appears to be in the Guarding position. These have led to the explanation that Cherubim are bodyguards and vehicle carriers of the Lord. Ezekiel's vision of the Cherubim, which is practically the same in the tenth chapter as in the first, is one of the most difficult in Scripture, and has given rise to a multitude of explanations. Heb 9:5 and above it cherubim of glory overshadowing the mercy-seat; of which things we cannot now speak severally. Are they Real or Imaginary? Eston and other protestant theologicans interprets them as simply symbolic and not real. This may be traditional obstinacy to accept other living beings. While western rationalistic period refused to acknowledge extraterrestrials simply because it might overthrow the superiority of man., all the rest of the world accepted the coexistence of other beings both embodied and disembodied here on earth as well as outside the earth in this dimension and in other dimensions as well. For the Africans and the Indians a spiritual world is always near us and inside and around us. But the Cherubims are not the throne as is evident in the Revelation scene. Since the human rulers imitated the living beings and made themselves carved thrones of cherubim. They all wanted to be like God. In the ark these carved images represented the living beings which actually exist in the heavenly dimension. These apparently had a material existence just like man while being an exalted spiritual being. The Ark and the Cherubim were symbolic illustrations and not Real living beings. It is possible for us to think of the cherubim as an artistic expression of Gods throne of grace and presence. The Israelites were in Egypt for a very long time and assimilated most of the Egyptian culture. Among them was their art. “Ark may have been illustrated by an artist using the conventions of Egyptian art in the historic period of 1220 BCE. It is a characteristic of Egyptian art that was nothing in the compositions was left to chance. Within Egyptian illustration, every gesture, symbol and glyph has a very specific meaning and the meaning of the whole is often enhanced significantly depending on the additive nature of its parts. As I built this illustration I couldn't help but marvel at the cumulative significance and consistency the Egyptian symbology had with literary and scriptural references to the Ark. In this sense the Tabernacle and all that is within and without which the Lord has described were a symbolic communication to the people. It is this Paul illustrates in Hebrews in detail. Hence there is in some sense to interpret Cherubim of the Tabernacle and furniture of Temple as symbolic expressions of the message of Salvation. These are symbolic of aa very high order angel whose primary duty is to guard the things of God. Thus -- the many eyes for vigilance, the many wings for swiftness, and their nearness to the throne of God. (See: Genesis 3:24 and Exodus 25:18-22). They are often called as covering angels. 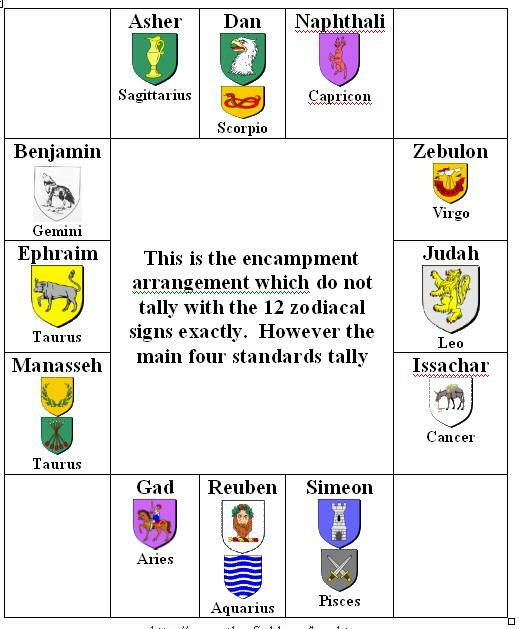 These four tribes tented on the four sides of the tent of meeting and their standards were always flying on the four sides of the tent of meeting. Yhvh is he who resides on the praises of his people. After the covenant the arrangement of the tribes around of the tabernacle were ordered by God. Num 2:17 Then the tent of meeting shall set forward, with the camp of the Levites in the midst of the camps: as they encamp, so shall they set forward, every man in his place, by their standards. At the center of this order was the tabernacle itself; the tribes would arrange themselves to the east, south, west, and north in relation to the tabernacle. Since the tabernacle was symbolically the presence of God with them, this meant all order in Israel began being centered around God Himself. Num 2:2 The children of Israel shall encamp every man by his own standard, with the ensigns of their fathers' houses: over against the tent of meeting shall they encamp round about. Num 2:7 And the tribe of Zebulun: …. Num 2:22 And the tribe of Benjamin. Num 2:25 On the north side shall be the standard of the camp of Dan according to their hosts: . Num 2:29 And the tribe of Naphtali . ”the four living creatures united in the cherubic forms described by Ezekiel were represented upon these four standards" (Keil and Delitzsch, Commentary on the Pentateuch, III, 17). Here we see the idea of God residing in the midst of his people. The people are representative of the Cherubim symbols. His people are God’s expression - God’s faces. It is varied and in its unity gives His character. 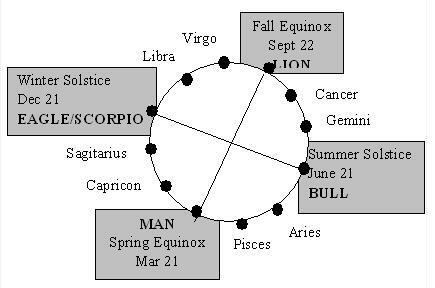 The four signs are also seen in the four zodiacal points of Solstices and Equinoxes. These four signs do concur to the four faces of the Cherubim. Again the concept of God in the midst of his people is expanded to include the whole of creation. 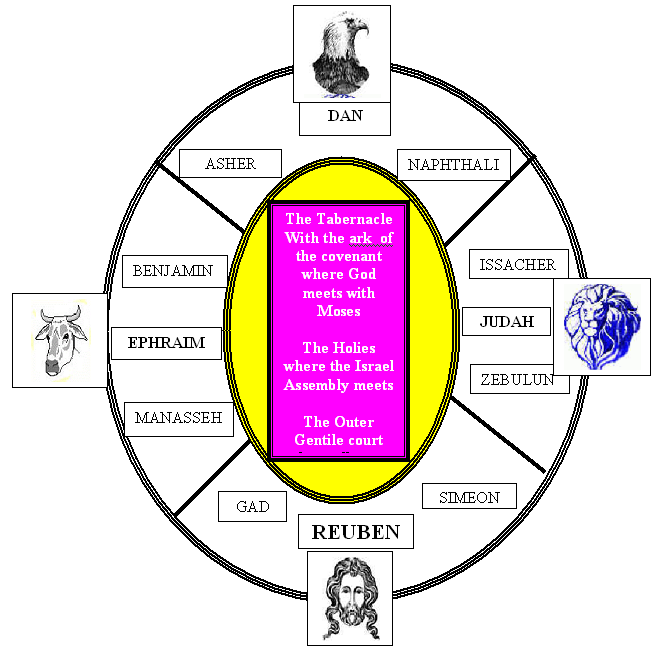 The inner circle of creation includes the angelic beings like the cherubims, then we have the Levitical camp then we have the 12 Israel tribes and beyond that it poito the whole universe with God as center. Each standard is said to have had as its "sign" one of the twelve constellations. One standard with its sign on it, for each tribe, hence called an "ensign"
God chose the Jews as an example. The whole picture of the Tabernacle and the Jewish nation under God was a picture in miniature of God in relation to His creation. He stand enthroned in the midst of His people. The whole cosmos with God as the head is one organic unity. He is in the midst of His Sons. We know for certain that Satan was a covering Cherub. Some interprets that the initial two cherubs covering the real mercy seat were Michael and Lucifer. Michael is represented as the Commander in Chief of the Army of the Lord - a Male form while Lucifer is the female counterpart of Michael, foremost in beauty and wisdom. There is also a shade of resemblance here between Adam and Eve. Eve because of her beauty and cleverness was the cause of the fall of Mankind. At any rate the fall of Lucifer or Satan suggests the free will of Cherubim and in that sense they are similar to man and all the intelligent creatures of the cosmos who are Sons of God. (1Sa 4:4; Psa 80:1; Eze 1:26, Eze 1:28). Cherubim covered the mercy Seat of God. God spoke from between the cherubs. No one can see God and live. So the form of God is covered by the wings of the cherubim. In a slight variation of thought . the Hebrew term may mean "cherub of anointing, who covers", therefore a royal, anointed being, overshadowing others with its wings to shelter them. If this be so, we must add royalty and beneficence to the characteristics of cherubim. Symbolicaly Cherubims become the covering which makes man difficult to see God as he really is. Rather than beaming rays of sunshine, they will see imaginary figures streaking through their minds. According to Strong's Exhaustive Concordance the word, cherubim, comes from the Hebrew word, keruwbim, which is a transliteration and means "imaginary figures." The cherubim were sewn into the veil, that which represents man's mind, and is the obstacle which separates him from the Most Holy Place. The curtains of the tabernacle also contained cherubim, as well as the two doors of the temple, not to mention the walls. Everywhere in the tabernacle and the temple cherubim were sewn and made. Man cannot understand God through his intellect. They are the covering. 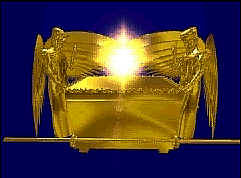 Only the elect are allowed into the tabernacle, into the holies and then into the holy of holies. Even then not without blood. Another interesting thought with great stretch of imagination is given below. Seraphim and Cherubim are known to be Angels dwelling in the Angelic realm. The Seraphim and Cherubim live upon the sea of glass in the future from our day. The Angels in heaven are our future (or like our future as those beings that went ahead of us), just as we are their past. The Angels round about the sea of glass were once humans upon the earth. God destroyed the first creation where the Angels of heaven had once lived as humans. God destroyed the first creation because God had created the first humans with hearts and minds knowing both good and evil, which God realized by experience would not work. God realized that evil and good could not live together in harmony side by side. Therefore, the first creation (the creation before that of Adam and Eve) was destroyed in a flood of water, as seen in Genesis 1:2 where the earth is shown to be covered in water. The Angels in heaven were once humans upon the earth in the first creation. There is nothing new in our world. All that has taken place since the re-creation of Adam and Eve, has already been. When Adam and Eve were created (as described in the book of Genesis) they were told to REPLENISH (repopulate) the earth; which means to restore the earth with people as it once was in the first creation. In Isa.6:2 the Seraphim have six wings as opposed to the Cherubim who have four wings in Eze.10:15,21. The Angels in heaven (upon the sea of glass) do not have literal wings. Their bodies are of a physical nature, however their bodies are more glorious than our human earthly bodies. The Angels being described as having wings reveals that they are heavenly beings who have ascended from the first earth to their new abode in heaven upon the sea of glass. The Angels in heaven are upon all twelve planets in our solar system in the future of our day. As it was in the Garden of Eden at the time of Adam and Eve is how it is upon all twelve planets (stars) where the Angels dwell; however, the abode of the Angels is far more glorious than the earth at the time of Adam and Eve. The sea of glass (diamond) is around the earth in the future. Upon the sea of glass are trees, rivers, animals and atmosphere, as the world upon the sea of glass is an image of the earth as it was at the time of Adam and Eve (Garden of Eden). Beneath the sea of glass (diamond) are the twelve foundations of gemstones; the sea of glass (diamond) is the top layer. Above the diamond covering are trees, plants, animals, and the Angelic beings. The city called New Jerusalem in Rev.21:10,14 has twelve foundations. The city New Jerusalem is of the future world that is upon the sea of glass (diamond). God’s throne (Shekinah Glory) is within the city New Jerusalem. Before God’s throne is the only section of the sea of glass that is not covered with soil, grass, trees and so forth, see Rev.4:6. The Angels who dwell in heaven are in physical bodies which are like human bodies, yet are far more glorious than Adam or Eve’s. The Angelic beings cannot physically leave their abode upon the sea of glass, though their spirit can leave their physical bodies and travel through time and space. The spiritsof Angels are permitted to be among us upon the earth, and they can return to their physical bodies at will. The spirits within the Angels are the same spirits within humans. In other words, it is as if two identical spirits are in two bodies (one Angelic, one human) in two different time periods (one of the future, one of the past). The wicked angelic spirits who rebelled in heaven are of the same spirits who are in human form, who shall rebel against God by rejecting God’s revealed word. These are however too farfetched imagination verging on science fiction. We wont be able to find biblical foundation for this imaginative interesting concept. Kabbalah means “received teachings” or simply “traditions” and is derived from the Hebrew word “Kabel” which means “to receive” Kabah the revelation of Allah, God was originally applied only for Oral Law received after the destruction of the Second Temple in Talmud. It was at least written down only after the destruction of the Second Temple – during 150 AD to 600 AD . . The Divine or Archetypal World. Atziluth is the highest plane of Creation. It is the well spring from which everything emerges. It is difficult for the Human mind to comprehend the workings or the ideas that are associated with such high realms of consciousness. The very essence of pure thought and to some extent the very mind of the Creator may be glimpsed briefly in the Realm of Atziluth. Atziluth is administered by the Highest of Beings the Cherubim. They would appear to be extremely close to the Mind of God, in fact closer than any others. thought and is the backdrop for all that is. Without the Divine influence of Atziluth nothing is Atziluth represents the ideas that are in the mind of God. The Archangelic or Creative world. The First Hek of Tetragrammaton. The world of Briah is the world of early Creation. The Archangels form the governing and ordering body. Briah is most commonly associated with the Element of Water. It is in Briah that the Mighty Archangels appear to establish the Will of God. Briah is where the plans are made and the "blueprints" are drawn. Beriah, the "World of Creation" is also called "the Throne"
Ten sefirot being further from the En Sof then the sefirot of the universe of Atzilut, are of a more limited potency, although their substance is still of the purest nature and without any admixture of matter. The angel Metatron inhabits this world. He constitutes the world of pure spirit and is the garment of Shaddai, i.e. the visible manifestation of the Divine. He governs the visible world, preserves its harmony, and is head of myriads of angels [C.D.Ginsburg, S.A.Cook, Kabbalah, p.621]. The world of Beriah is described in the Zohar as consistinhg of seven higher heavens or firmaments which emanante from the seven lower sefirot of Atzilut, and are beyond the traditional seven heavens to which the stars and planets are fixed [Paul Krzok, "The Cosmological Structure of the Zohar", p.32 The Hermetic Journal, no.20, Summer 1983)]. This is also the world of the angels centred around the throne of God. The Angelic or Formative world. Yetzirah is the World of Formation. This is the realm of logic and intelligence. The intellectual world represented by the Element of Air. Yetzirah is the world of Angelic Choirs. Here are the Seraphim and the Elohim. Choirs of Angels bring the resources that are needed to bear for completion in Assiah. Yet they are still non-material. This is the abode of the angels, who are wrapped in luminous garments. The myriads of angels are divided into ten ranks, according to the ten sefirot, and each angel is set over a different part of the universe, and derives his name from the element or heavenly body he guards [C.D.Ginsburg, S.A.Cook, Kabbalah, p.621]. The Final Heh of Tettragrammaton. Assiah is the world of action. this is the material world in which the results of the efforts of God become material. The Ideas that were started in Atziluth reach manifestation in Assiah. The physical universe and Malkuth are the representation of Assiah. The four Elements are the primary building blocks and are present in the physical sense in Assiah. This is the region of the grossest sefirot, consisting of material substance. There are ten degrees, each lower than the other. Alternatively, there are seven earths (the highest presumably being the earth of human beings, i.e. the physical universe) one beneath the other, and beneath the lowest of them, seven hells, again arranged in sequence. In contrast to Christianity, the souls of sinners are there not only to be punished but also to be purified, before ascending, the exception being the hell of Abadon, where the soul is apparently destroyed [Paul Krzok, "The Cosmological Structure of the Zohar", The Hermetic Journal, no.20, Summer 1983) pp.33-4]. LION = Strength - Kingship - Jesus the Lion of Judah as represented in the Gospel of Mathew. Here Jesus is represented as the King of the Jews and the expected mesia, the Jews were waiting for. Matthew revealed him as a LION; the Lion of the tribe of Judah. His genealogy was written as from David Matthew 1:1. OX = forebearing, patient, the burden bearer, suffering servant and the sacrificial beast. Servant as represented in Mark’s Gospel. Mark showed him as an OX; the servant. His record commenced upon that note without any reference to his origin, birth or genealogy. Cherubim then is a representation (if we want to interpret them as symbols only) of the perfect Man. These characteristics of the Lord, displayed during his life and ministry, all united to draw attention to his function in the Mercy Seat. Again it is this unity that represents the perfection in every Son of Goad. Thus in one sense the Cherubs represent the pecfected beings of the cosmos. Thus we do see many interpreters tend to identify the Cherubim as perfected saints in the presence of God serving him day in and day out and praising him and acting as angels of mercy. Though we realize that cherubim are exalted heavenly powers and virtues; yet if thou wilt, thou too shalt be one of the cherubim. For if cherubim means, Seat of God, remember what the Scripture says: The soul of the just is the Seat of Wisdom.